For once, Ed Brukbaker engages in some original Captain America writing…sort of. Maybe it is Andreyko’s influence. Since now it seems that the title lead character is taking a back seat to a character THAT SHOULD HAVE STAYED DEAD, why not just rename the darn thing? 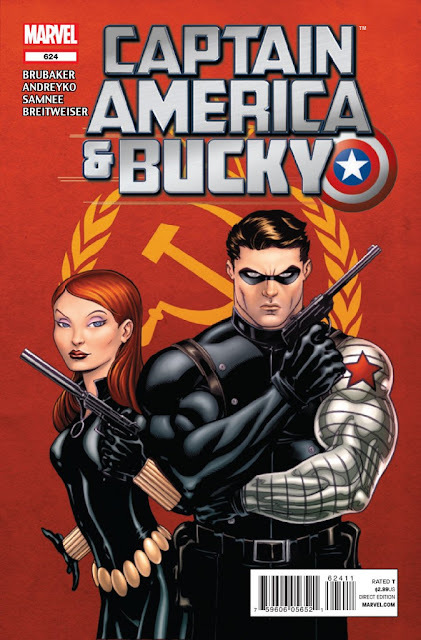 In this issue, we are shown Bucky’s training of the Black Widow in Russia and how Bucky and Natasha became an item. Heck, even the name of the combo isn’t that original. Boris and Natasha/Bucky and Natasha become close, real close. We see how even though Bucky is brainwashed into being a Communist dirtbag, the conditioning never takes full effect. Bucky/Winter soldier is then shown being frozen between missions, as we get a montage of his recent history. The story wraps up in the present with Bucky visiting his sole remaining relative. The art by Samnee is a real letdown from the fine work of Butch Guice and others who have worked on Cap. Except for the romantic scenes, the book’s art looks like something you would see in Archie instead of Cap. The only saving grace is the fantastic coloring done by the fetching Bettie Breitweiser. While it has been an interesting peek at events from Bucky’s point of view, the title of the book is CAPTAIN AMERICA and Bucky, not Bucky and Black Widow. At the very least, we could have kept up World War II tales of Cap and Bucky from Bucky’s point of view. Brubaker must be getting all wrapped up in his Criminal and Fatale series, because quite frankly, his writing on Cap and Cap & Bucky is not very original. See what happens if/when this book goes another issue. Hopefully Bucky will be off to Winter Soldier land and we can get back to what the book should be about. This one barely remains on my pull list.